Every Gosling deserves a good collection of Mother Goose in their nest. Some folks like classic editions they remember for their own childhood such as The Real Mother Goose illustrated by Blanche Fisher Wright. But to me, the Faberge egg of the flock of Mother Goose editions available in the contemporary and comprehensive My Very First Mother Goose Library edited by Iona Opie, one of the compilers of the scholarlyThe Oxford Dictionary of Nursery Rhymes . The oversized books come in a boxed set, which includes both My Very First Mother Goose and Here Comes Mother Goose (My Very First Mother Goose) . All the greatest hits — “Humpty Dumpty,” “Jack and Jill, ” “1, 2, Buckle My Shoe” — are here, and also the charming lesser known rhymes and clever twists on standards. This, along with Lucy Cousins’ Book of Nursery Rhymes and Mother Goose Remembers offer the most accessible introductions to the rhythm and rock of the English language. If you are one of those lightweights who just can’t abide farmers’ wives chasing blind mice and carving knives and the like, well, then, try the politically correct Father Gander Nursery Rhymes by Douglas Larche. Personally, I don’t mind a good blackbird baked in a pie, and chances are, school-age siblings are in the mood for a slice as well. You can be very generous and give an older Monster Goose by Judy Sierra or the “Surprising Sequels to Mother Goose Rhymes” found in Whatever Happened to Humpty Dumpty? : And Other Surprising Sequels to Mother Goose Rhymes by David Greenberg. It’s nice to have something slightly related (and slightly naughty!) to read while Mom is coddling and cooing the new arrival. « Is it Awkward Discussing Problems With Your Boss? Did You See This Segment on Today? 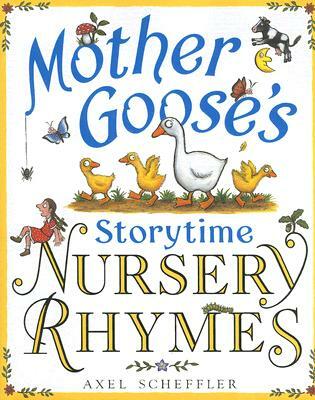 Personally I don't care for Mother Goose- some of the rhymes are a bit morbid. I guess back in the day and in Erope they were cutting edge..now..not so much, IMO. Anonymous, the author of the article writes in the article, "If you are one of those lightweights who just can't abide farmers' wives chasing blind mice and carving knives and the like, well, then, try the politically correct Father Gander Nursery Rhymes by Douglas Larche. "I think it's the rhyming they are looking for when reading to young kids.